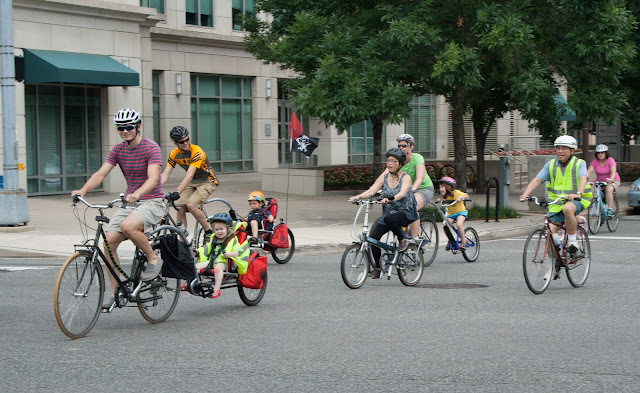 If you're looking for a fun family group ride, why not check out the next Kidical Mass ride in Arlington on Sunday. Maybe the kids were inspired to ride more after Bike to School Day; this is a good way for them to find new friends and enjoy a fun, slow-paced ride. This year, we're headed back to the Bluemont Trail and Taste of Arlington, but we're trying a new park to start, we're going to stop for a short playdate with a caboose and we'll ride through a section of Arlington Kidical Mass hasn't visited yet (with the requirement for flat rides, we're going to run out of these soon). It promises to be amazing and fun, and quite taste-y. Parking: On the surrounding residential streets - I've heard Edison is a good bet. End: Taste of Ballston -- Wilson Blvd & Glebe Road. You can RSVP to our facebook event).